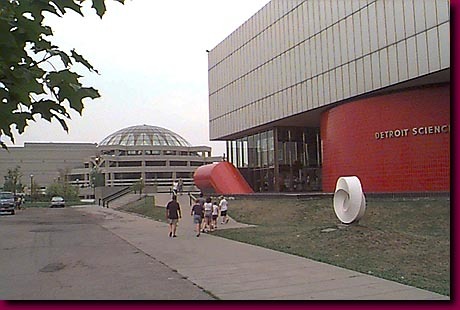 The construction of the Detroit Science Museum in the early eighties marked the first new development in the Cultural Center in decades. Seen in the background is the newly opened Charles H. Wright Museum of African American History. "Culture? You want culture? Come to Detroit, we've got culture up to our armpits!" I couldn't help paraphrasing that Australian joke, changing only geographic and human anatomy locations. Contrary to Detroit's image in the media, our city and environs contain numerous and splendid cultural institutions and activities. Clustered in Detroit's Cultural Center are the Detroit Public Library, Detroit Institute of Arts Museum of African American Museum, Detroit Historical Museum, Center for Creative Studies, International Institute, Wayne State University and, shown here, Detroit Science Museum.